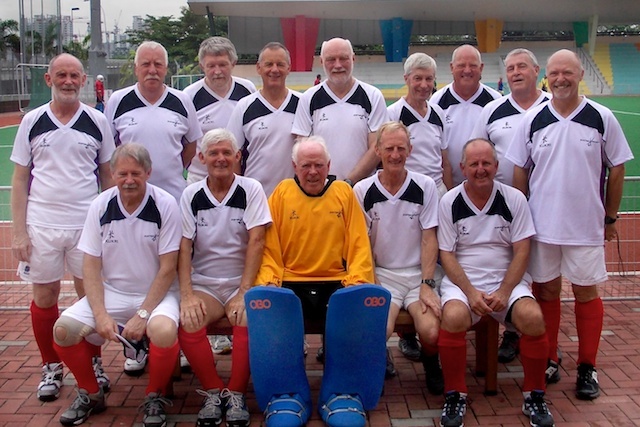 The Singapore Grand Masters Cup for Over 60s involved four teams: Australia, England, New Zealand and Scotland. Each team played six times in a double round robin. Scotland finished bottom of the pile and England were the winners, with Australia and New Zealand respectively second and third. Scotland put up stiff resistance to a strong England team but ran out of steam in the final quarter. Two defensive mistakes in the first half left the half time score at 2-0, when it could easily have been scoreless, but the midfield tired in the strength sapping conditions and England began to pass the ball around Scotland. They were well worth their three goals in the final period but the Scots were by no means disgraced. Inside knowledge provided by the six Australian based players led to a formation in which the most influential player, Bruce Snape, was man-marked by David McIntosh, whose performance earned him the man of the match award from the Australian squad. The other danger man, midfielder David Peebles, was also man marked by the nearest available Scottish midfielder. However, both slipped their markers to score, each time taking advantage of slow Scottish substitutions which left them completely clear in the circle. The Scots worked hard but could not avoid losing another three goals in the face of intense Australian pressure. At last a goal to celebrate! It was a good one, a cracking drive by new boy and recruit from Western Australia Alan Lynn direct from a short corner. For the first time in the tournament, Scotland exerted a bit of pressure on the opposition but in an attempt to play the game farther up the field with three forwards, they left too much space for the lively and fit New Zealand midfield and forward line. For the third time, five goals were racked up by the opposition, leaving Scotland at the bottom of the pile at the end of the first round robin. A new formation emerged to take on the English with only two forwards and a rearranged midfield. It is clear from the result that this did not work, but it was probably due more to players' failure to grasp what their role was in the formation than with any fault in the concept. Players reverted to what they knew, leaving gaps into which England drove to put the defence and keeper George Black under enormous pressure. The basic faults were that the forwards rarely did the harrying and chasing that they were expected to do, and that the midfield sat too deep, congesting the circle and giving the defence no out ball. The nearest Scotland came to scoring was when Peter Gordon picked up a long ball and rounded the English keeper with two defenders in close attendance. The presence of the defenders was enough to make him hesitate instead of shooting instantly, and the move fizzled out. What a difference a day makes! There was another minor change in the shape of the midfield and in the centre of the back line, and this time everyone knew what was expected of him. The midfield played higher and this both relieved the pressure on the defence and created the space for Scotland to work the ball forward with good interpassing. However slack marking at the beginning of the first and second halves allowed Australia to inch out a two goal advantage, with play relatively even apart from the two goals. In the final quarter, Australia added a fortuitious third when a Snape cross from outide the circle was deflected behind George Black off Ian Downie's stick, and the umpire awarded a goal instead of what should have been a penalty corner. The result was spoiled by a loss of concentration which twice allowed an Australian attacker to have a free shot from close range to make the final score 5-0. During the final period, George Black performed heroics in goal and he was rightly voted man of the match by the opposition for the second day in a row. While Scotland put no less effort than in previous matches, tiredeness and injury/illness spoilt all the good work and allowed New Zealand to boss the match. Scotland were on the back foot for most lf the game and rarely troubled the opposition defence. Peter Gordon did his best to launch isolated attacks and Douglas Caren was awarded man of the match by New Zealand for his tireless work up front, harrying and chasing defenders.